February | 2016 | Broomsticked The Life and Times of a Real Witch. In love with a Witch? The perfect Valentines Gift for the Witchy Woman, or Man in your life! So here is a awesome idea I did as a promotion for my group Mystic Market on Facebook. 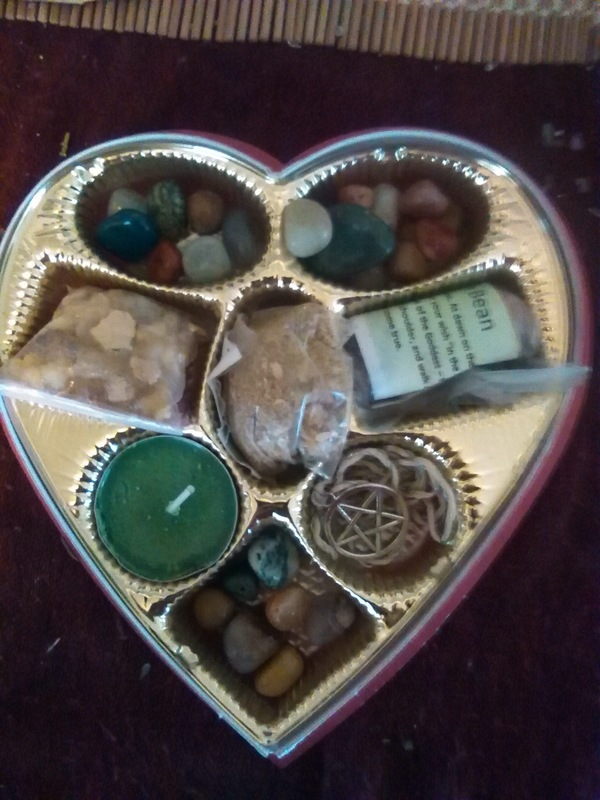 Empty out a chocolate holding heart box of your choice and fill with witchy fun things! I used small crystals, mojo wish beans, various incenses and resins, a money spell candle, and some simple Jewerly. You could also pull this off for a Birthday gift easily! So if your reading this now go buy the Heart boxes while still on sale ! I haven’t written in a bit mostly because it has been incredibly beautiful out and have been doing more daytime money spells , business spells and luck blessings out in the warm beautiful sun. I am a huge fan of doing sun magick. I find for any spell with intentions of the physical or material the sun really adds a swift kick to them. Also Road Openers or unblocking spells. Normally in summer it is hard to perform the spell castings with the kids home and in my hair. So when we get these beautiful warm days of spring while everyone is still in school I really work it to my advantage. I have applied for a part time day office job for the city here, if I get that I will be looking at day camp for the kids and will be able to do more Sun Magick all summer right after work. So I’m pretty excited! I’ll keep everyone updated. Even if I don’t get the job or later decide it’s not my thing, if my Artfire shop stays busy enough over the summer I probably will still consider some child care so atleast a few days a week I can get those money spells and other spells really cooking under that bright desert sun!